The 109th Corman's Creepy Classics Issue is a whopping perfect-bound 176 pages! FOR A LIMITED TIME: Choose between the regular issue and the 2018 San Diego Comic-Con Scary Exclusive! See description below. He has more than 400 credits as a producer and more than 50 as a director. He's truly the Master of Genre Films. 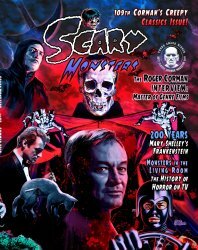 In Scary Monsters #109 we pay tribute to living legend Roger Corman, whose films from Day the World Ended and Attack of the Crab Monsters to Pit and the Pendulum and X: The Man With the X-Ray Eyes have thrilled Monster Kids for generations. Mr. Corman's influence on the motion picture industry and the movie-going public is everlasting. We also celebrate the 200th anniversary of Mary Shelley's classic, influential novel, Frankenstein, and we'll have plenty of scares from award-winning Dr. Gangrene's Mad Interviews, Kaiju Korner, Strange Days, Weird USA, and more!. 2018 San Diego Comic-Con Scary Exclusive: This was offered to attendees at Comic-Con only, but we have a few still available. If you want the 2018 San Diego Comic-Con Exclusive (bagged and boarded stickered version, Scary Collector Card #2 featuring Roger Corman, and a copy of the vintage digest-size 2000 Scary Special #50.5) make your selection at the drop-down menu above. Collectors Note: If you want your regular issue bagged and boarded (placed into an archival quality "bag" with white backer board), click on the second drop-down menu above to select this extra service. Here is Dr. Gangrene's sneak preview of Scary Monsters #109 so you can see what you're getting!